Did you know that many islands such as the Maldives are likely to disappear below rising sea levels during our children’s lifetime? This Thursday, 5th June 2014, join thousands of people across the planet doing their bit for the planet and to protect it for future generations. World Environment Day (WED) is the United Nations Environmental Programme’s main push to encourage worldwide awareness of the problems facing our beautiful and precious planet and a call to action. Over the past few years the movement has grown in size, popularity and power and it now reaches across the globe, mainly though social and traditional media. It also serves as a ‘people’s day’ for doing something positive for the environment, hopefully leading to lots of individuals, businesses and organisations doing something for good and becoming a collective power that creates a strong and positive impact on the planet. “Planet Earth is our shared island, let us join forces to protect it” declared UN Secretary-General Ban Ki-moon at the launch of the 2014 International Year of Small Islands and Developing States. Small islands and developing nations are those places most at threat from environmental disaster, mainly due to climate change and rising sea levels. There will be the Third International Conference on SIDS in September and WED is being used to encourage a greater understanding of the urgent need to help protect these islands in the face of growing risks and vulnerabilities. Ice caps are melting, sea levels are rising and the oceans are becoming more acidic killing off vital marine life. Greenhouse gas emissions continue to rise and extreme weather events such as heat waves, floods, droughts, tornadoes, hurricanes and tropical cyclones are more frequent and severe. This winter’s floods in the UK were appalling but we can survive them and eventually rebuild our lives. On small islands and in poor developing nations the chances of surviving let alone rebuilding are much slimmer. This Thursday is the day to make your voice heard by governments and organisations around the world. The challenge this year is to recognize that we all face the same challenges and are connected and united by our common goal of a sustainable and prosperous life for all on this planet. The call is to raise our voices in solidarity with one another, particularly with the citizens of the small island states who lack the economic and political clout that we are lucky to have here in the UK. Many ideas being shared include clean up campaigns, food waste reduction initiatives, walk-to-work days, plastic bans, art exhibits, tree-planting drives, concerts, dance recitals, recycling drives, social media campaigns and different contests to name but a few. Remember that every action counts no matter how small. The effects of our actions can ripple out either as awareness, education or action itself and when multiplied on a global scale the result can be huge in its impact. You can spread the word through social media. 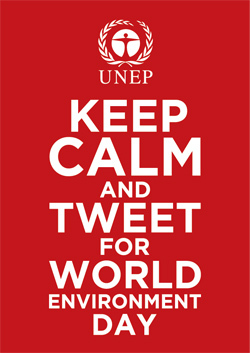 Last year, World Environment Day was one of the top 10 most tweeted topics on Twitter. This year, make your voice heard together with the millions who will show their solidarity for the islands, climate change and the environment. Raise your voice not the sea level! You can make a public pledge to reduce energy consumption, shop locally, eat seasonally, reduce plastic bags and packaging when shopping, shop second-hand, recycle and reduce landfill, conserve water(share a bath! ), become a paperless office, grow your own, make your own, walk to work/school, and much, much more, although maybe not all at once! There are all sorts of interesting events going on around the world from school recycling days to trash fashion shows, 10k races to concerts. In Kenya the Kiribati forest was the location of tree planting activities done together by NGOs, UN employees and local government representatives and other tree planting is going on across Africa. If you want to show solidarity with the UN’s environmental campaign to save our planet and to support our fellow man under threat from climate change then you can organise an event, make a personal pledge or spread awareness around through social media. It all helps. Register your participation on the website at http://www.unep.org/wed/. You can join a celebrity on their challenge or make up your own challenge, it’s up to you!